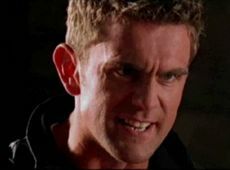 Scott Maslen stars as Claude Speed, the lead character of the live-action film. When released in 1999, Grand Theft Auto 2 featured an opening cutscene with various life-action scenes intended to illustrate the nature of the game. The cutscene was pieced together using footage taken from an eight-minute, unnamed short film (henceforth referred unofficially as GTA 2: The Movie) created for the purpose of advertising the game. The film is notable for being the only official material by DMA Design (now Rockstar North) to be shot entirely in live-action, but lacks any form of dialog between characters. It also implies the game's playable protagonist, thought to be depicted in the film, to be named Claude Speed. Some of the film's scenes are also integrated into the game's menus. The film has since been made available to the public and is downloadable from Rockstar's website in the form of 8-part Quicktime files or a single RealVideo file. The game's opening cutscene, which features portions of the film in superior quality, is available in the game's folder in the form of a Bink (.bik) file. The film opens with overhead scenes of a city as police chatter is heard, revealing a criminal has evaded them. It then cuts to Claude Speed striding on the streets, only to be chased by a group of armed gang members (implied to be Rednecks, based on their choice of baseball caps and plaid shirts; one of them is wielding a chainsaw). Looking to escape, Claude carjacks a parked van, throwing its occupant out and driving the vehicle away, shaking off his pursuers. While in the van, Claude, to his joy, discovers boxes of Zaibatsu Corporation drug shipments inside. With his newly discovered loot, Claude stops to break into a black sedan, load a few of the boxes into its trunk, and takes off in the stolen car, abandoning the van. However, Claude's act has been reported by the driver of the van to the Zaibatsu, and an informant depicted as a homeless person updates the Zaibatsu on Claude's whereabouts and change of vehicle. The Zaibatsu Corporation promptly obtains a record of Claude, and dispatches an assassin (who doubles as a janitor in the company) to kill Claude. Meanwhile, Claude discovers a police car tailing him, resulting in a chase that lasts for a period of time. After the police car spins out of control, allowing Claude to escape, Claude seeks refuge in a paint shop, where his car is resprayed with a white body color. This allows him to slip through police detection, and continue to go about his business. Still under the influence of the drugs, Claude makes another stop, this time an underground Yakuza haunt, where an unknown individual is in the process of being tortured with baseball bats. With two boxes of Zaibatsu drugs to show, Claude is asked by a Yakuza boss to help locate and rescue a fellow associate, in exchange for a monetary reward. Claude complies and leaves, as the tortured prisoner is bludgeoned in the head with a hammer by the boss. "Shoot him when he's down"
With the Yakuza boss' order in mind, Claude locates a step van stopping at an intersection, exits his car and guns down the driver, shooting him three times and spitting on him. Claude then proceeds to open the van's cargo hold, revealing a group of people dressed as monks. Claude finds his man, and returns him to safety, where Yakuza members greet him with open arms. Claude leaves to prepare for his next job as night approaches. Using the step van acquired in his last mission, Claude arrives at a storefront to pick up the Russians, as promised. They are heading to a bar where Elvis is performing a gig; the bar scene reveals Redneck members with Yakuza members celebrating the recent rescue of their cohort. Claude and the Russians arrive, as Claude paves the way for the Russians to storm in and provoke a firefight that presumably results in casualties on all sides. Claude walks away with a grin on his face as a Russian is seen gunned down. The final scene depicts Claude walking to a sports car and attempting to break into it. A shadowy figure emerges from the background, revealing himself to be the Zaibatsu assassin, who fulfills his responsibility by shooting Claude three times in the back, killing him. The film ends with Claude collapsing beside the car as the assassin walks away. Four gangs from the game were included into the movie: the Rednecks, the Russians, the Yakuza and the Zaibatsu. It is interesting to note that the first three gangs do not actually meet each other in any of Anywhere City's three districts, while the Zaibatsu appears in all three of them. In addition, the Rednecks' liking for Elvis is also depicted in the movie. The use of the spray shop as a method of evading the police is featured in the movie, as Cluade has his car resprayed white after attracting heat from a squad car. Claude runs errand for multiple gangs, the same way the player does jobs for gangs in the game. Claude does not display any allegiance to any gang in the movie, the same way the player does not need to stick to working for only one side. Claude may be seen executing various forms of carjacking, a central feature in the GTA series. Claude Speed (the game's playable protagonist) is played by Scott Maslen in the film. Scott Maslen also played DS Phil Hunter in the The Bill and also plays Jack Branning in the BBC soap opera EastEnders in the UK. The film was shot in 1999 New York City with the World Trade Center (pre-9/11) and the Manhattan Bridge in clear view, instead of the game's anonymous city of the future. It should be noted, however, that two fictional locations were mentioned in the film: "Chernobyl Docks" and "Disgraceland". The film depicts a blue-and-white NYPD 1991-1992 Chevrolet Caprice police car as a pursuit vehicle, as well as a black BMW E39 528i driven by Claude, which is later repainted white. A Ford van and a large step van are also commandeered by Claude at different points of the film. Claude Speed escaping from a group of Rednecks in a stolen Zaibatsu van. The Zaibatsu inspecting Claude's rap sheet. The police in pursuit of Claude. Claude meeting a Yakuza boss as a person is tortured in the background. Claude shooting the driver of a step van (revealed to be an African American) before spitting at his body. This scene is not included in the game's opening cutscene. Claude ferrying the Russians to deal with the Rednecks. The Zaibatsu assassin shooting Claude in the back as the film closes. This page was last modified on 19 April 2012, at 19:18.